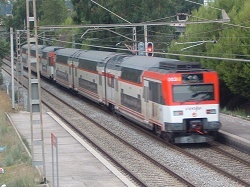 Until relatively recently, Spain did not have the best of train systems. Being the second most mountainous country in Europe, it was often difficult to link certain cities due the mountains and hills in the way. The resulting railway system often involved winding tracks and slow trains. All this however is changing, the first high speed track (tunneling through mountains where necessary) based on the French system was opened from Madrid to Sevilla in 1992. This system is now being expanded, along with significant improvements to the standard track. Spain expects that in 2010 it will become the world leader in length of high speed rail track - surpassing France and Japan. The Spanish rail system is state run by RENFE and the English version of their website is Here. There are however a confusing number of different types of trains. We have more information on the Spanish High Speed Rail Network, the trains that run on it, plus price information, Here, including the Altaria, which runs on conventional track for the last part of the journey to Algaciras, and the Shorter distance high speed Avant trains.